Kenneth Bornstein lives on Long Island with his wife and two sons. He was born and raised in the Brighton Beach section of Brooklyn, New York. He graduated from Abraham Lincoln High School and earned his Bachelor's Degree in Athletic Administration from St. John’s University and his Juris Doctorate from St. John's University School of Law. After law school, Mr. Bornstein joined the Legal Aid Society in Queens, handling a variety of cases from inception to disposition. Mr. Bornstein's work with the Legal Aid Society provided courtroom experience that would be valuable later in his career. 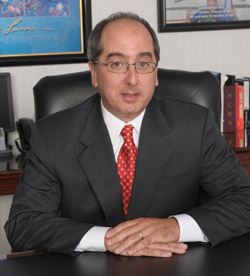 He is a member of the Nassau County Bar Association, New York State Trial Lawyers Association and St. John's University School of Law Alumni Association. He is also a mentor with the Nassau County Bar Association Mentor Program and a volunteer with the We Care Fund of Nassau County. He has volunteered in community organizations, as Director and Secretary of the Merrick-North Merrick Little League, and, Vice-President of the Merrick Lion’s Club.